SJF Material Handling Equipment has partnered with E.D.G. Enterprises, Inc. (EDGE) to provide complete cutting-edge Warehouse Business Software & Inventory Management Solutions designed fit almost every environment and industry. Our complete control and warehouse management suite of hardware and software solutions are specifically designed to seamlessly integrate with any pre-existing warehouse or distribution centers operations. From single user inventory software systems, to completely automated warehouses, SJF and EDGE have cross-industry solutions that work in nearly every warehouse or supply chain. Best of all, our software is modular... You only purchase the features and functions you need. Finally, products for businesses small to large, that eliminate the pains of maintaining inventory control for an efficient warehouse. EDGE and SJF provide a comprehensive suite of warehouse and inventory management solutions tailored to enhance warehouse operations. Each is loaded with a vast array of inventory tracking features that allow you to quickly and easily manage your warehouse/stockroom and supply chain. Couple these solutions with our material handling knowledge and capabilities, and you have a one-stop source for most of your supply chain management needs. EVOLUTION – a full Warehouse Management System designed for complex warehouse environments and software applications processes. This system is unparalleled in the ability to handle most supply chain warehouse automation scenarios. EVOLUTION is a functionally complete software solution package that is easy- to-use and customer configurable. We can also integrate any number of real time cloud based tablet, RF, RFID and voice recognition requirements. EVOLUTION utilizes state-of-art technology and our new tablet portability to maximize execution speed, velocity and performance across the supply chain. Every function, from packing and shipping to receiving and putaway and labor management, will significantly enhance your supply chain execution. XPEDITE – an affordable Inventory Management System with extraordinary functionality that enhances your supply chain and significantly helps your day-to-day business and growth. EDGEWISE – A new addition to our WMS systems product designed for clients whose warehouse management software environments demand portability with full visibility for less total cost. The EDGEWISE system combines the MS Windows 8/10 Operating Systems with the ease-of-use of a tablet. Warehouse Intelligence – the automation resource planning hub of the EVOLUTION suite. 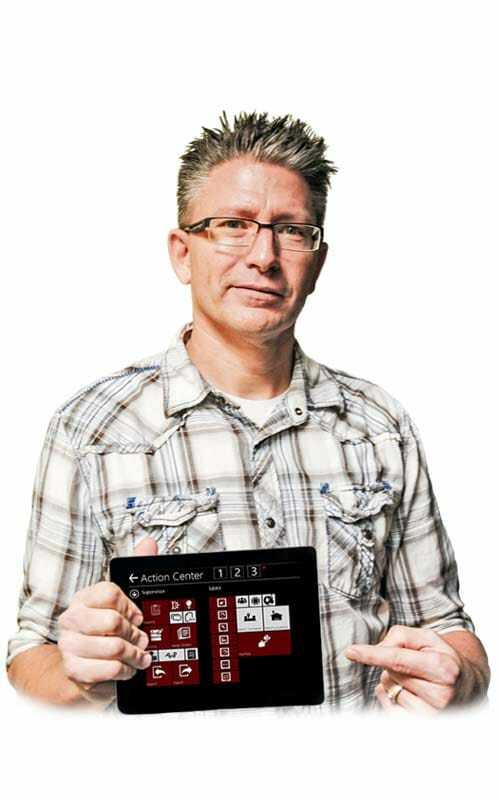 This core processor is the brains behind the brawn when it comes to managing challenging warehouses and software systems. Conveyor, carousels, pick-to-light, automated guided vehicles and more are easily operated by this warehouse control system module. Ease of Use – Touchscreen Graphical User Interface for ease of use with Windows 7/8/10. Functionality – We don't just manage carousels, we also provide complete Warehouse Management and supply chain management capability. From receiving through shipping, with everything in between, we've got it all. Why rely on two independent systems to run your warehouse? Consider the maintenance burden; the potential finger-pointing when a problem arises; the headaches of making the systems integrate both electronically, as well as, your warehouse process flow. Adaptability – Save space with our software. Reduce labor. Increase your inventory and shipping accuracy. Reduce your product handling. That's what a properly engineered and integrated carousel system can do for you. By adapting to your operations, streamlining your business, helping with your mission critical items and getting your products to your customers on-time, we'll save you time and money year after year. Cost – Our warehouse management solutions software will save you money and reduce costs in the short term due to lower license fees over other types of business software. Architectural adaptability will also save you tens of thousands of dollars on the short term purchase, as well as long term maintenance total costs. Technology – Our architecture (Windows and Open Systems SQL) allows us to take on any size management platforms project or enterprise wms for a full integrated solution. Configurability – You name it, chances are we do it. There are few scenarios we have not tackled with over 25 years of management software experience with carousels. Companies Worldwide are Using SJF and EDGE – Why Aren't You? Over 25 years of proven technology on Windows platforms using tablets with incredible inventory control functionality, make managing your inventory simple and inexpensive.